In order to try more than just the typical tourist vodka-and-caviar interpretations of Russian cuisine, abandon the major cities and head to the hinterlands in search of hidden delicacies. The 800-year history of Vladimir's (116 miles east of Moscow) cherry orchards involves the entanglement of many cultures and epochs: Byzantium, the Mongol Empire and the transformation of the medieval federation of Kievan Rus into the states of Russia, Ukraine and Belarus. Sweet Byzantine cherries won the hearts of Kievan Rus inhabitants as far back as the early Middle Ages. After Kiev was ravaged by the Mongols, the much-loved berry was moved to Vladimir, which became one of Russia’s medieval capitals. In Vladimir, the fragile southern tree was crossbred with the local frost-resistant ground cherry, to obtain a unique variety with an elegant sour-sweet flavor. By the 19th century, Vladimir cherries were beloved all over the country. Out of five traditional Vladimir cherry varieties, four are still cultivated today. The best way to taste local cherries is at the annual Savior of the Cherry Feast Day. 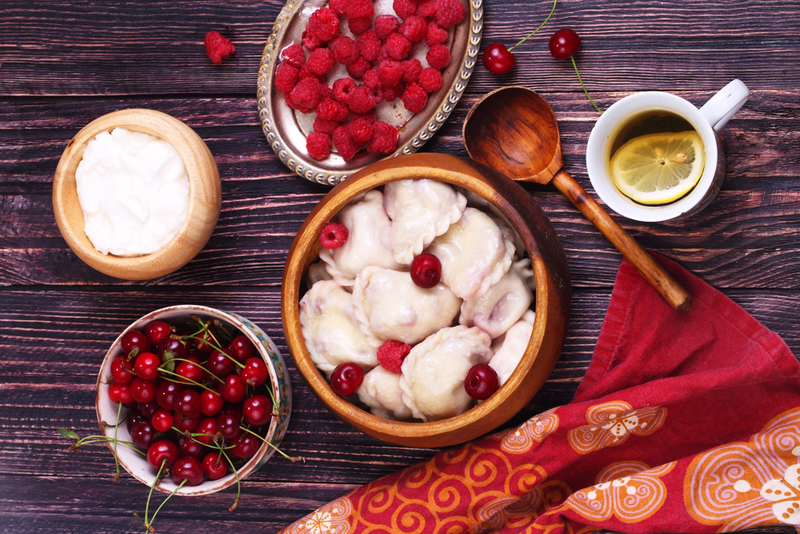 This is a great place to experience Russian small town fun with competitions ranging from cherry and cherry-jam eating to shooting with cherry stones and tossing sweet cherry dumplings (vareniki). This region is full of deserts and salt lakes with summer temperatures averaging 35 С (95 F). With such a dry climate, it is no wonder that the watermelon chose Astrakhan (865 miles south-east of Moscow) as its second homeland (this fruit originated in Africa). The people of Astrakhan have been growing watermelons since at least the 1200s (some say as far back as the 900s) and have achieved such mastery that once you taste the local "berry," you will find other kinds too sour and watery. The hottest season is August when watermelons are harvested. To gather a perfect watermelon, you need to cut it from the vine on the day of its maximum ripeness. In high season you can buy a kilogram of watermelons in Astrakhan markets for as little as $0.08 (six rubles). If you go straight to the source you can get these sun-warmed fruits practically for free: they’re that cheap. The end of the harvest season is celebrated with a traditional festival when you can taste local signature types of watermelon and also experimental varieties of all shapes and sizes. Generations of Karelians have preferred tender white Onega vendace fish to its neighbor – the St. Petersburg smelt. The exquisite taste of the vendace stems from the Onega River ecosystem. Its cold water is filtered through shungite deposits, an ancient rock that purifies the water and air. Karelians envelop fresh vendace in a layer of onions and poach it in a small amount of water, adding nothing but a pinch of salt. Traditional Karelian recipes are a manifestation of culinary austerity, where the quality of ingredients and the purity of taste are the top priorities. In the Russian Empire, vendace was a rare delicacy, known only to St. Petersburg gourmands that ate it at exquisite restaurants. Today this regional specialty is valued by locals, restaurateurs in the regional capital Petrozavodsk (632 miles north-west of Moscow) and fishermen. Quite overlooked during Soviet times, the small town of Tutaev (192 miles north-east of Moscow) was a gastronomic destination as early as the 17 th century. Its residents cultivated a special variety of onions, the Romanovsky. In contrast to a common bulb onion with its straightforward and blunt pungency, the artisanal Romanovsky onion is sweet, succulent and features no hints of bitterness. The locals prefer to eat it fresh and raw. Moscow-based chefs confirm that it is the perfect choice for onion soups and marmalades. Its red, tightly packed bulbs can easily rival celebrated French examples such as the Roskoff Pink onion from Brittany. Sylgy, Yakutian horses, are short, sturdy and covered in thick fur resembling enormous stuffed toys (the capital of the Republic of Yakutia, Yakutsk, lays 5202 miles east of Moscow). They can dig out grass from beneath the snow and survive fluctuating temperatures ranging from -70 С (-94 F) in winter to +40 С (104 F) in the summer. A rigorous natural selection process, along with strict breeding and adherence to traditions have made it possible to keep one of the world's most ancient horse species as pure as possible. Their meat has an intense taste and the brisket, called oygos, is considered the best part. Traditionally, it is cut into chunks, covered with hot water and seasoned with onions, pepper and bay leaves. It is cooked briefly, then cut into thin slices and served on a flat dish. You can try this treat any time of year. It is especially easy to find during Ysyakh, the Yakutian cultural holiday.